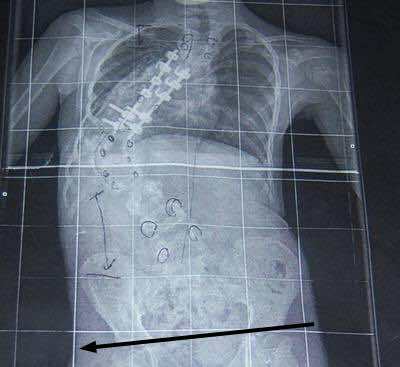 This is a bad scoliosis; unlikely yours is anything like this. Pain in right side from head to leg means separate injuries to different parts of the spine, or perhaps a scoliosis. Pain starts from the joint in buttock spreading after 2 to 3 hours to lower back then to shoulder finally to neck and head. It goes sometimes to my leg and all this happen in the right side only. There are different possible causes. Mostly likely you have a short leg which has given you a curvature, so it affects your whole spine. Ask a friend to stand behind you and place both hands on your hips; are they more or less level. If you bend forwards, is there a rib hump? Is one shoulder higher than the other? That radiation down the leg means you must take this seriously; hence your letter, obviously. If it's at the back of the thigh, then it's probably the sciatic nerve; front of the thigh means the femoral nerve. Either way start doing some lower back exercises every morning before getting out of bed. If that doesn't help within a month, then you are going to need professional advice. Especially if sitting in a normal kitchen chair, straightening the leg, and you get pain in the back and leg.